See farther below for images and transcriptions of the April entries and for an alphabetical list of the people mentioned. 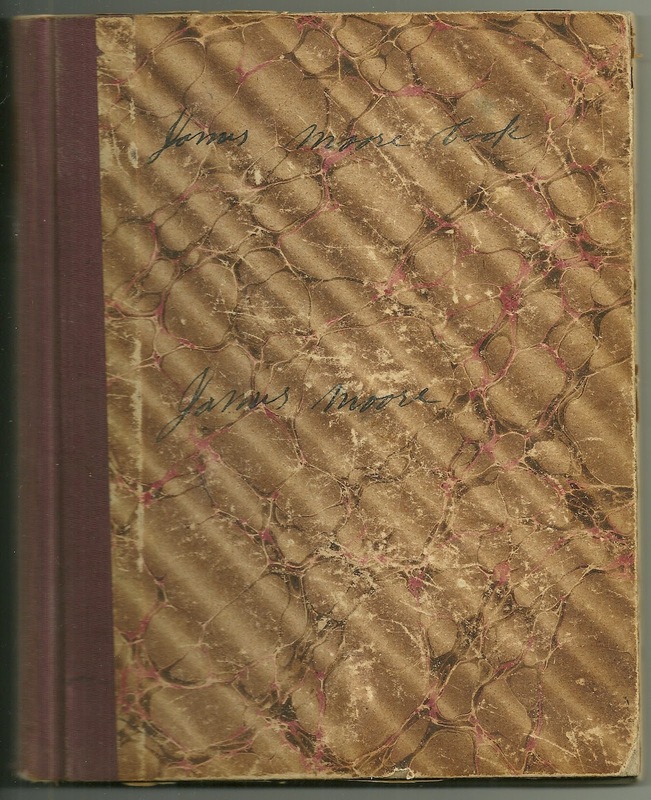 On 21 August 1858 James Moore married Laura Ann Garland, who was born 5 February 1838, at Ellsworth, Maine, the daughter of Leonard Jarvis Garland and wife Azuba A. "Zuby" (Moore) Garland. Her paternal grandparents were Josiah and Sarah "Sally" (Swett) Garland. Her maternal grandparents were Edward and Elizabeth B. "Betsey" (Maddocks) Moore. James and Laura had four children that I could find, perhaps more. 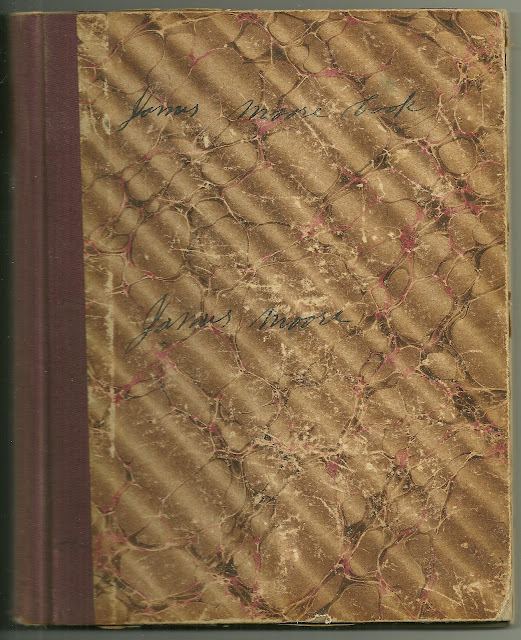 James Moore died March 27, 1903, an event the reader can see coming, sadly, for quite some time. If you have any corrections and/or additions to the information above, please leave a comment or contact me directly. People mentioned in the entries [or in my added notes], in alphabetical order by surname, not necessarily by given name. 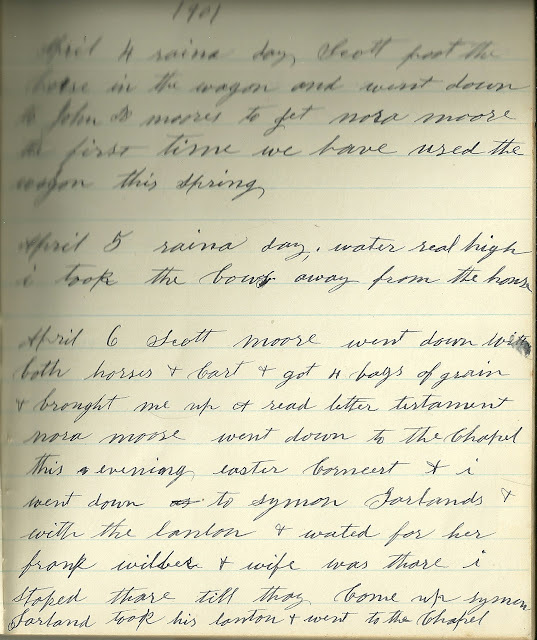 March 31, 1901 I went down to John R. Moore’s today and carried him some pain celery compound [I think he is referring to Paine's Celery Compound, an elixir from Vermont.]. He has got a bad cold. April 2, 1901 Whitmore Garland had a sawing bee today sawing firewood. 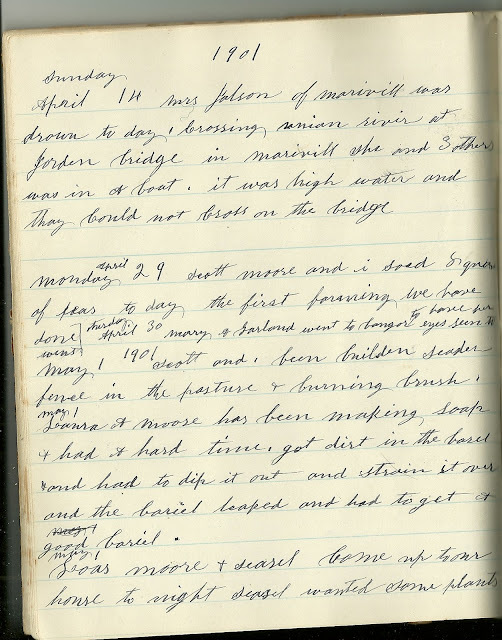 Laura A. Moore went up and rode part way back with George Garland and Aunt Betsey in a wagon and got in a snow drift and broke his trace chain and Laura walked home. 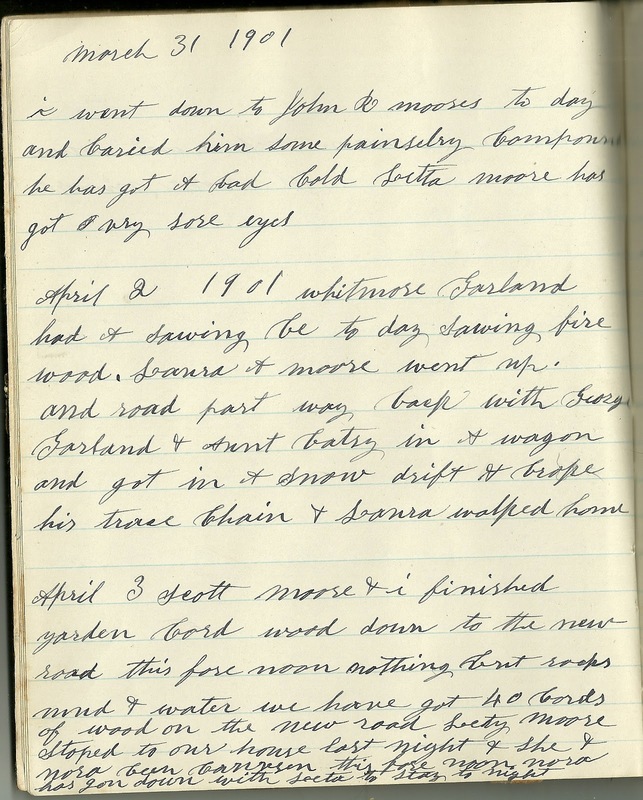 April 3, 1901 Scott Moore and I finished yarding cord wood down to the new road this forenoon. Nothing but rocks, mud and water. We have got 40 cords of wood on the new road. Letty Moore stopped to our house last night and she and Nora been [? carrying, carousing?] this forenoon. Nora has gone down with Lettie to stay tonight. April 4, 1901. Rainy day. Scott put the horse in the wagon and went down to John R. Moore’s to get Nora Moore. The first time we have used the wagon this spring. April 5, 1901. Rainy day. Water real high. I took the [boat? bow?] away from the house. April 6, 1901. Scott Moore went down with both horses and cart and got 4 bags of grain and brought me up and read letter testament. Nora Moore went down to the Chapel this evening, Easter concert, and I went down to Simon Garland’s with the lantern and waited for her. Frank Wilber and wife was there. I stopped there till they come up. Simon Garland took his lantern and went to the Chapel. Sunday, April 7, 1901. John R. Moore carried Letty Moore down to Ellsworth High School. 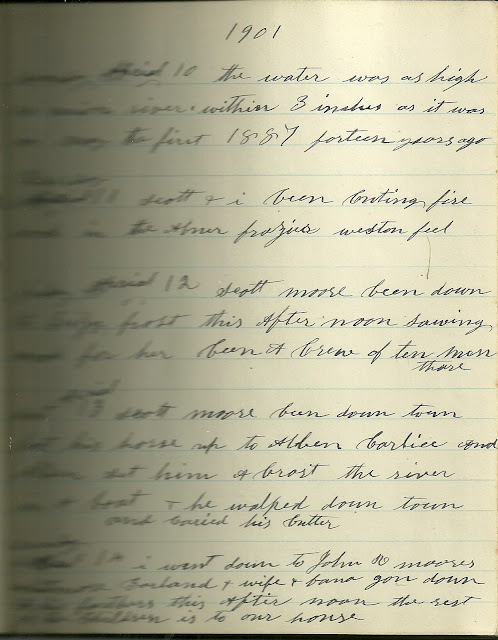 His reins broke while crossing Brimmer Bridge and come near drowned his horse, and Alben Carlisle and others helped him out and they carried Letty ashore. Narrow escape for them. The hand of God was with them. 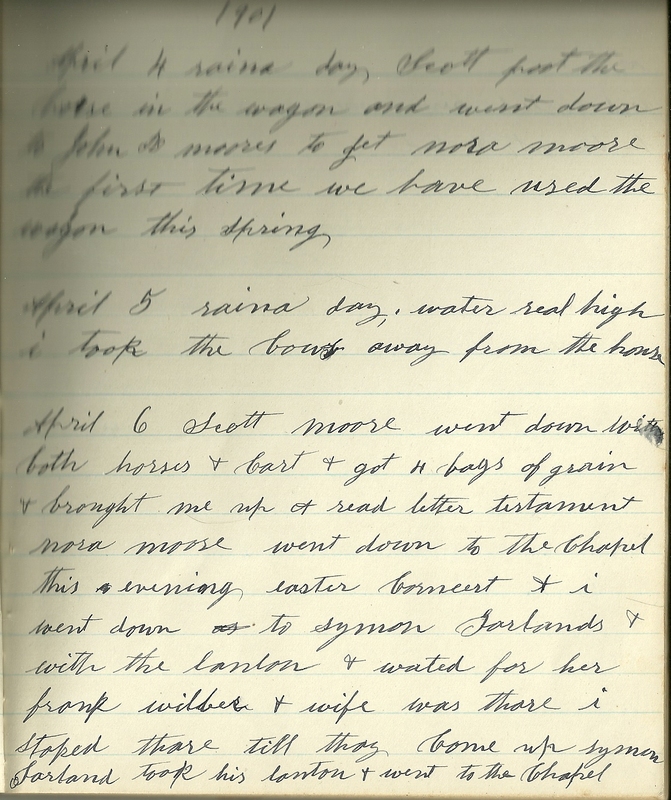 Monday, April 8, 1901. Mary Garland commenced teaching school in District #1 today. 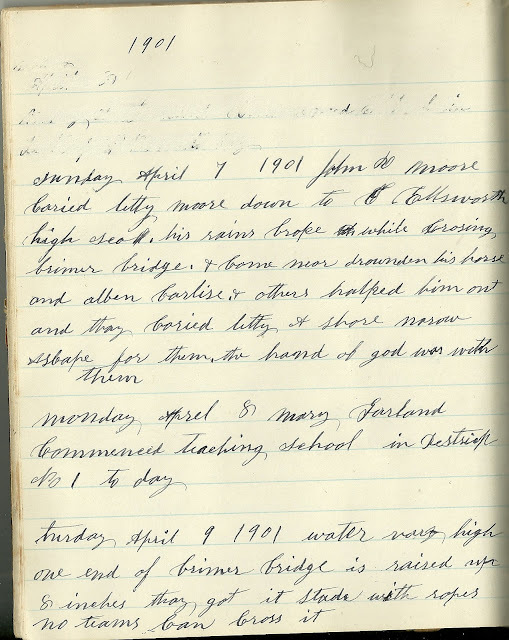 Tuesday, April 9, 1901. Water very high. One end of Brimmer Bridge is raised up 8”. They got it steady with ropes. No teams been cross it. Wednesday, April 10, 1901. The water was as high on Union River within 3 inches as it was in May the first, 1887, fourteen years ago. Thursday, April 11, 1901. Scott and I been cutting firewood in the Abner Frazier [Weston or western] field. Friday, April 12, 1901. Scott Moore been down to Lizzy Frost this afternoon sawing wood for her. Been a crew of ten men there. 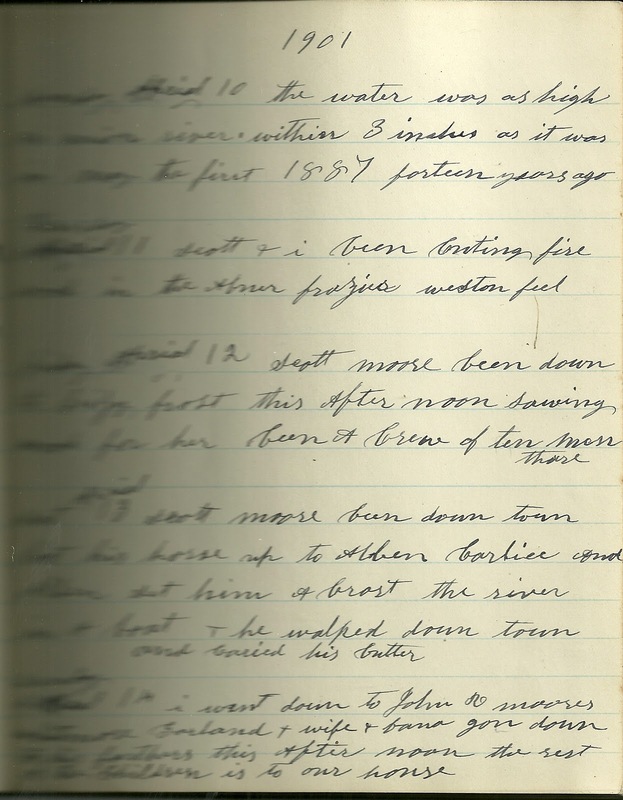 Saturday April 13, 1901. Scott Moore been down town brought his horse up to Alben Carlisle and Alben set him acrost the river in a boat and he walked down town and carried his butter. Monday, April 29, 1901. Scott Moore and I sowed 8 [?] of peas today, the first farming we have done. Tuesday, April 30, 1901. Mary A. Garland went to Bangor to have her eyes seen to.